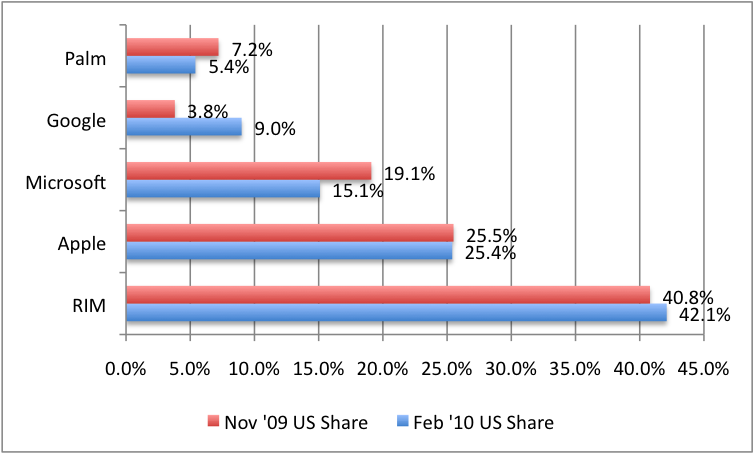 RIM, maker of the Blackberry, still has a commanding lead in smartphones in the US, with 42.1% market share for the 3-month period ending February 2010, according to ComScore. Blackberry is the platform of choice for corporate IT departments, so they are more likely to be in the hands of corporate managers. The biggest gainer in this list is Google’s Android platform, while both Palm and Microsoft have seen pretty steep drops over the past 6 months. So, if you were to base your decision on handset market share, your priorities would be pretty clear. However, market share alone does not paint the full picture. The Apple iPhone is the platform that really gave the mobile application space mainstream appeal. The iTunes app store is the largest and most profitable of its kind by a wide margin. The numbers are important not for their sheer size, but for what they say about how each platform is used. The iPhone gets used as much more than a phone. The Blackberry is a phone/email device with a browser. The others are trying hard to beat Apple at its own cool multifunctional mobile device game. These numbers are so large as to be almost meaningless to an app consumer. Nevertheless, they do emphasize the relative health of each platform’s app ecosystem, and by that measure, Apple is the 800-pound gorilla. There are now several paths to in-app advertising launched or nearly ready to launch. If your advertisers want high-impact, rich media ads in the mobile channel, these new mobile ad providers are set to deliver, at least on Apple iPhone and Android. So, how can we project the future? One good indicator of future performance is developer support. If developers see promise in a platform, they will write applications for it, especially if the hardware support is there. Over 30,000 developers use Appcelerator app development tools, and a survey of 1028 (really) of these developers in late March 2010 gives a good indication of the attitudes towards these mobile platforms. The Apple iPhone is still the platform most developers have interest in creating apps for. The Apple platform is popular because it has strong consumer acceptance and developers know you can make money from it. Palm’s recent financial difficulties have dampened developer interest. There are really no compelling reasons to invest in Palm-specific apps for publishers. 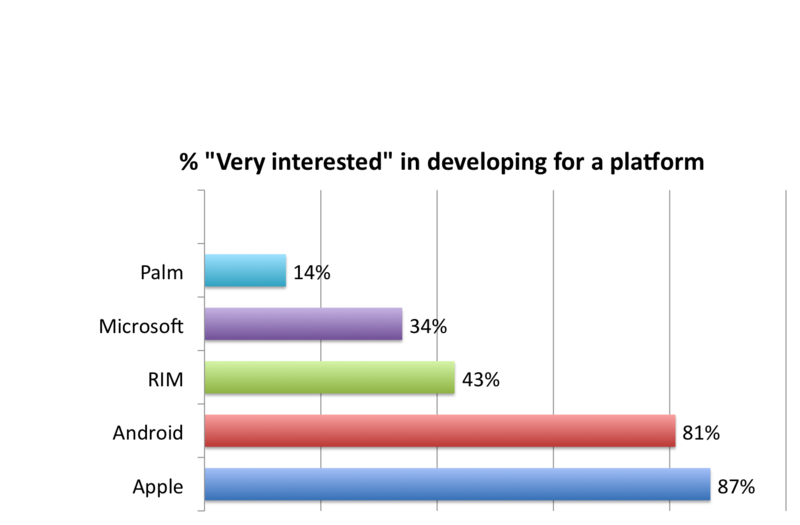 Developer interest in RIM and Microsoft has surged as both companies have made it easier (with better APIs) for developers to create new mobile applications. In addition, Blackberry makes it a point to accommodate carriers, in stark contrast to Apple. Android is the one to really watch in this race. 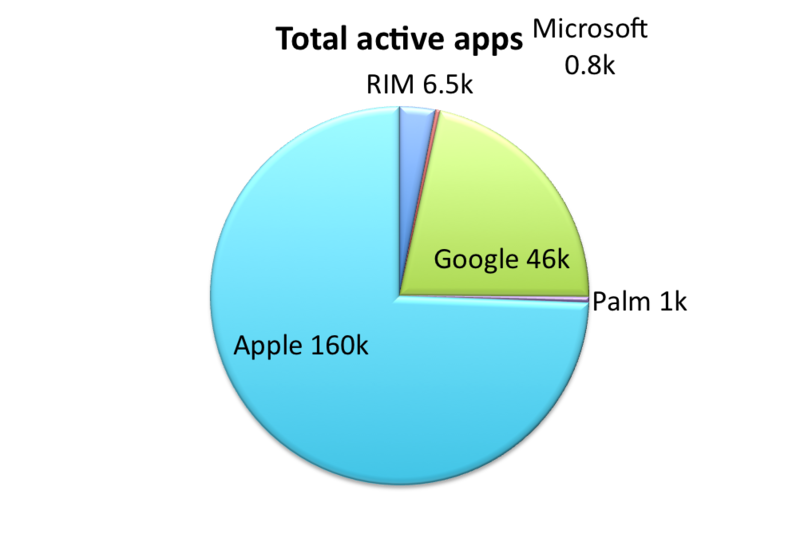 Google’s strategy to beat Apple makes a lot of sense. They will continue to offer decent (if not stunning) alternatives to the iPhone, but be available across all carriers, in many varieties, and usually at a lower price. Most importantly, Google’s purchase of AdMob positions them to be a significant player in in mobile advertising. The next big battlefield is for enterprise customers. Apple hasn’t shown a lot of appetite for this market in any of its product lines. RIM has built its success almost exclusively on the enterprise. Google is pushing hard on several fronts to be a heavy hitter in enterprise software, and Android is likely to pull share away from both RIM and Apple in this market. So, if your audience is largely corporate managers in medium to large enterprises, placing bets Google’s Android probably makes a lot of sense. RIM is huge in the enterprise, but their app strategy, particularly in-app advertising, looks less-developed. Microsoft, like RIM, has great enterprise penetration, and their new push to woo developers could reverse their slide, but Apple has managed to make Microsoft something of a joke in mobile devices to date. If your focus is consumers, Apple and Android are your top choices. The mobile landscape is changing very quickly, so it pays to have someone in your organization responsible for staying abreast of the technology and the major players. You need to be here. This post originally appeared on eMedia Vitals.